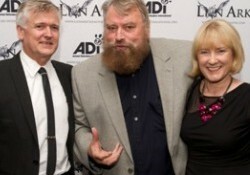 Actor Brian Blessed delighted the audience as he played host at the world premiere of Lion Ark at the Raindance Film Festival on October 1st. Celebrities turned out to support Lion Ark, which follows the epic battle to rescue 25 lions from illegal circuses in Bolivia. Nutritionist Gillian McKeith, singer-songwriter Lynsey De Paul, TV host Wendy Turner-Webster, Northern Line’s Dan Corsi and Wire’s Robert Gotobed attended the glitzy world premiere. Lion Ark is an uplifting story of bravery, compassion, camaraderie and determination – how a poor but proud country said “no” to cruelty and how attitudes to animals were changed across an entire continent. The film has already attracted droves of celebrity support and glowing reviews from those lucky enough to watch it ahead of its world premiere. Director Tim Phillips said he was “overwhelmed by the roaring reviews and celebrity support” and that the glamorous premiere was “a fitting tribute to the magnificent Lion Ark stars”.